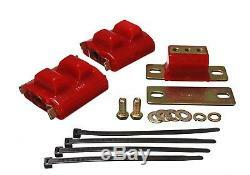 Engine Mount Kit-Motor And Transmission Mount Energy 3.1130R. AAIA Part Type Description : Engine Mount Kit. Country of Origin (Primary) : US. Harmonized Tariff Code (HTS) : 8708998180. Product Description - Long - 80 : COMPLETE ENGINE/TRANS MNT SET. See Item Specifics section for additional specifications about this part. To confirm that this part fits your vehicle, enter your vehicle's Year, Make, Model, Trim and Engine in the Compatibility Table. Also review the notes section in the compatibility chart for additional specifications about this part. The engine types may include 4.1L 250Cu. L6 GAS Naturally Aspirated, 4.1L 250Cu. L6 GAS OHV Naturally Aspirated, 4.1L 4097CC 250Cu. L6 LPG OHV Naturally Aspirated, 4.1L 4098CC 250Cu. L6 GAS OHV Naturally Aspirated, 4.3L 260Cu. V6 DIESEL OHV Naturally Aspirated, 4.3L 260Cu. V8 GAS OHV Naturally Aspirated, 4.3L 262Cu. V6 GAS OHV Naturally Aspirated, 4.4L 267Cu. V8 GAS OHV Naturally Aspirated, 4.8L 292Cu. L6 GAS Naturally Aspirated, 4.8L 292Cu. L6 GAS OHV Naturally Aspirated, 4.8L 292Cu. L6 LPG Naturally Aspirated, 4.8L 4786CC 292Cu. L6 GAS OHV Naturally Aspirated, 4.8L 4801CC 292Cu. L6 LPG OHV Naturally Aspirated, 5.0L 305Cu. V8 GAS OHV Naturally Aspirated, 5.0L 307Cu. V8 GAS Naturally Aspirated, 5.0L 307Cu. V8 GAS OHV Naturally Aspirated, 5.0L 5031CC 307Cu. V8 GAS OHV Naturally Aspirated, 5.7L 350Cu. V8 DIESEL OHV Naturally Aspirated, 5.7L 350Cu. V8 GAS Naturally Aspirated, 5.7L 350Cu. V8 LPG Naturally Aspirated, 5.7L 5736CC 350Cu. V8 GAS OHV Naturally Aspirated, 5.7L 5736CC 350Cu. V8 LPG OHV Naturally Aspirated, 5.7L 5737CC 350Cu. V8 GAS OHV Naturally Aspirated, 6.6L 400Cu. V8 GAS Naturally Aspirated, 6.6L 400Cu. V8 GAS OHV Naturally Aspirated, 6.6L 6555CC 400Cu. V8 GAS OHV Naturally Aspirated, 6.6L 6556CC 400Cu. V8 GAS OHV Naturally Aspirated, 7.5L 455Cu. V8 GAS Naturally Aspirated, 7.5L 455Cu. V8 GAS OHV Naturally Aspirated, 7.5L 7456CC 455Cu. V8 GAS OHV Naturally Aspirated. This part fits vehicles made in the following years 1973, 1974, 1975, 1976, 1977, 1978, 1979, 1980, 1981, 1982, 1983, 1984, 1985, 1986, 1987, 1988, 1989, 1990, 1991, 1992, 1993. We have been offering automotive parts & supplies for sale since Parts Geek, LLC was formed in 2008. We pride ourselves in providing the best customer service on the Internet. WARNING: This product may contain chemicals known to the State of California to cause cancer and birth defects or other reproductive harm. Portions of the part information on this page have been provided by WHI Solutions, Inc. The item "Engine Mount Kit-Motor And Transmission Mount Energy 3.1130R" is in sale since Tuesday, July 31, 2018. This item is in the category "eBay Motors\Parts & Accessories\Car & Truck Parts\Engines & Components\Motor Mounts". The seller is "autopartsgeek2" and is located in Marlton, New Jersey. This item can be shipped to United States, Canada, United Kingdom, Denmark, Romania, Slovakia, Bulgaria, Czech republic, Finland, Hungary, Latvia, Lithuania, Malta, Estonia, Australia, Greece, Portugal, Cyprus, Slovenia, Japan, Sweden, South Korea, Indonesia, Taiwan, South africa, Thailand, Belgium, France, Hong Kong, Ireland, Netherlands, Poland, Spain, Italy, Germany, Austria, Israel, Mexico, New Zealand, Philippines, Singapore, Switzerland, Norway, Saudi arabia, Ukraine, United arab emirates, Qatar, Kuwait, Bahrain, Croatia, Malaysia, Brazil, Chile, Colombia, Costa rica, Dominican republic, Panama, Trinidad and tobago, Guatemala, El salvador, Honduras, Jamaica, Bahamas, Viet nam.